Here are a few updates, news and noteworthy links for this week. Make sure to check out the latest book about Performance Management written by Steve Player and the late Jeremy Hope. It’s called Beyond Performance Management: Why, When, and How to Use 40 Tools and Best Practices for Superior Business Performance . I just downloaded it for my Kindle and will post a review as soon as possible. Visualization of data is one of the hottest topics these days. No matter where I go, people are taking a huge interest in it. Infographics are floating the Internet, for example. Companies are looking to refine their dashboards with better visuals. This was also apparent at the Gartner BI Summit earlier this week. Despite the tremendous attention, there are only a few good books about this topic in the market. 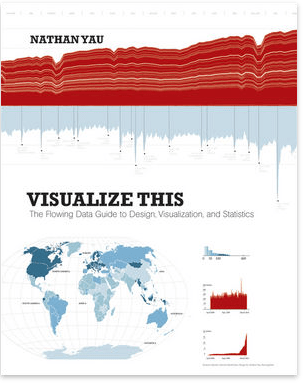 One of them is Nathan Yau’s title Visualize This: The FlowingData Guide to Design, Visualization, and Statistics . This week, I was able to finally read it all the way through. Did I enjoy reading it? Yes and no. The remaining chapters of the book contain valuable content as well. The author covers topics such as handling data and picking tools for building charts. Several chapters are dedicated towards describing how to best visualize certain problems (e.g. patterns, proportions, spatial relationships, etc.). Each section provides plenty of examples and some good ideas. I enjoyed working through this. But I do have to say that the content isn’t nearly as deep as let’s say Stephen Few’s material. A good book for BI professionals? So far so good. There is just one thing that you should know: Many chapters are also full of technical instructions that teach you how to build graphs and charts in the open source package R along with Adobe Illustrator. There is a lot of code in the book. Technical folks might enjoy this. But it is not my cup of tea and most BI professionals will hopefully build their charts using the corporate BI platform. To be honest, I went ahead and skipped those pages. Nathan Yau’s book Visualize this! is definitely a good book. I learned a few things here and there and took ample notes. It is also entertaining. However, one has to understand that this is not necessarily a book dedicated towards BI professionals. Rather, this is a book for people who are looking to build infographics and other standalone visualizations. Nevertheless, you can tell that Nathan Yau is passionate about it and he inspired me to hone my skills. If you are looking for a deeper and more business oriented read, I would rather recommend the books by Stephen Few and Edward Tufte.